Shakespeare without words. What’s left? 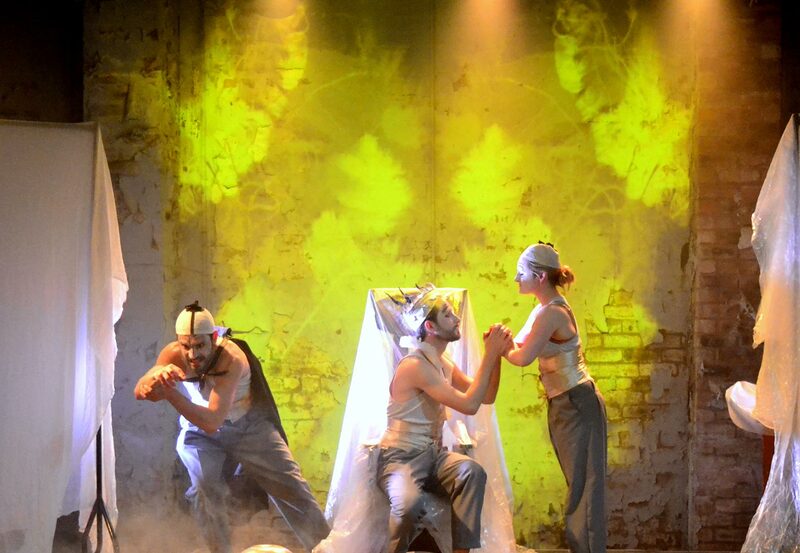 In Ludens Ensemble’s Macbeth: without words, plenty. Drawing on the aesthetic of silent films and Victorian gothic with the near-constant use of live sound mixing, a trio of performers playing all roles conveys the story effectively through movement and subtitles. This spooky adaption taps into the heavy darkness and supernatural elements of the story in an easy to follow and visually compelling production. The design is the most striking element of the show. Greyscale, sexless costumes are the base for elements of victoriana – waspies, a skeletal skirt, capes and papery crowns. Large screens and dust sheets host an array of productions, from silent movie captions to abstract splodges of colour. Haze is used liberally, but it actually feels appropriate to this production to create fog over the heath. The dust sheets are also cleverly used to create ghostly apparitions and shadows, though these could be used more often as a design motif. Two microphones and prerecorded sounds are mixed live to create rich soundscape of suspense and violence, though silence is used to highlight powerful moments of suspense. The two men and one women are strong physical performers evidently influenced by theatrical clowning and animal work. Their focus and intensity are unwavering, especially as Macbeth’s torment grows. Expressed outwardly, this becomes the centre of the story. Though there are a few extracts of text, stage directions and summaries projected, Macbeth: without words would be hard to follow without knowing the story already. A freesheet with a plot summary would go a long way to ensure all audience members are catered for. Some of the scenes could use lengthening to reflect their importance to the story, particularly the banquet scene. This is a visually stunning adaptation of Shakespeare’s play that in no way underserves the original by stripping away the text. Ludens Ensemble create a vocabulary of movement, images and sound that feels just as rich as Shakespeare’s. Macbeth: without words runs through 29th August. Hello, I am desperate to learn if there a video or short film of this. I am struggling to teach this topic to my year 11 literature group. Any film (or live performance) would be greate. Hi Angela, probably best to contact the theatre company. Good luck!